BOSTON - The Boston University men's ice hockey team came up just short in a high-scoring affair with second-ranked Massachusetts on Friday evening at Agganis Arena as the Minutemen held on for a 7-5 win. BU erased deficits of 1-0, 3-1 and 4-3 but the visitors never trailed in the contest en route to their 20th win of the season. The Terriers, who got two goals from junior Patrick Curry and a three-point night (1g, 2a) from freshman Joel Farabee, now stand at 10-11-3 overall and 8-6-2 in Hockey East play. - UMass scored in the opening minute of play before senior Ryan Cloonan got an equalizer for BU at 6:20 of the first. - The Minutemen came right back, however, using goals from Bobby Trivigno and Jack Suter to take a 3-1 lead into the first intermission. - The Terriers got back into the contest when Farabee notched a 5-on-3 power-play goal midway through the third. - Curry drew BU even again at 4-4 with a tally at 15-14 of the middle stanza. 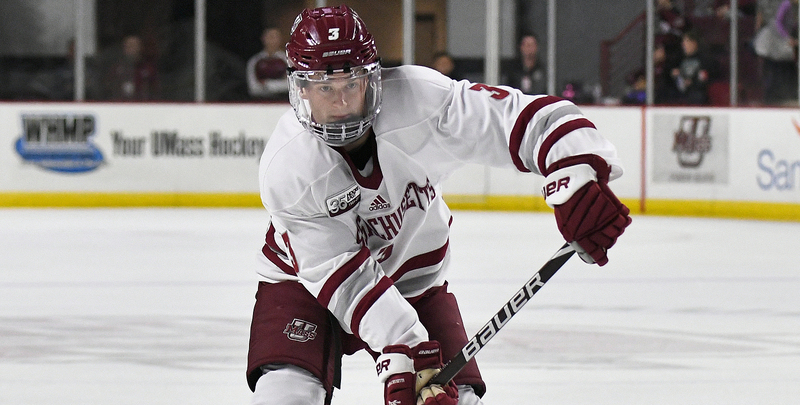 - UMass refused to go into the latter break without a lead as Philip Lagunov potted a goal with 3:24 remaining in the second. - It was Curry who once again knotted the game for BU as the junior snuck a puck past UMass netminder Matt Murray off a faceoff at 3:33 of the third. - Ty Farmer scored his third and fourth goals of the season at 8:49 and 17:45 of the final period to give the Minutemen a lead they would not relinquish. - Sophomore Logan Cockerill made it a 6-5 affair when he followed up a rebound off a Farabee shot with 1:31 to play, but BU was unable to extend the game. - John Leonard capped the scoring when he was awarded a goal with 15 seconds top play after being taken down at the blue line with nothing but an empty net in front of him. - BU went 1-for-4 on the power play while UMass came up empty of both of its chances as the Terriers extended their successful kill streak to 23 straight, their longest such run in nearly two years. - Matt Murray made 28 saves for the Minutemen, who held a narrow 34-33 shot advantage. - Friday marked the end of a five-game homestand, the Terriers' longest in 10 years. - The 67th Beanpot gets underway on Monday (Feb. 4) with the Terriers taking on No. 12 Northeastern in the late semifinal at 8 p.m.
- The game is a rematch of last season's championship game, which was won by the Huskies to end a 30-year title drought. - Monday's semifinal round will be televised live on NESN.